Summary: The cost of metal roofing is high so here is a metal roofing cost calculator to estimate metal roofing costs. Metal roofing costs may be high but metal roofs can last for 50 years. I've always been a metal roof fanatic. To me, roof design and roofing material are as important to a house as hair is to humans and I think metal roofs are beautiful. Metal roofs stand out and make a house memorable to both casual onlookers and prospective purchasers. A metal roof could increase the value of your home. Since a metal roof can last 50 years, it may be the only roof you ever have to install. Because of its lighter weight, a metal roof can be installed over an existing roof, saving time and money. Besides being fire and spark resistant, metal roofs are also resistant to wind and hail, all of which result in peace of mind and lower home insurance. If you have ever worried about snow building up on your roof or roof snow removal, metal roofs shed snow. Air conditioning costs can be lowered and comfort raised because metal roofs are energy efficient. 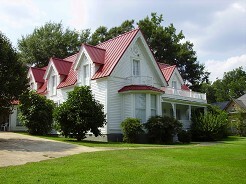 Considering a metal roof in the design phase of a new home plan provides design flexibility. And last but not least, a metal roof is almost maintenance free.